The Irish Water Spaniel is acknowledged to be a very old breed, but as is the case with so many Irish dogs and horses, it is impossible to separate fact from folklore and the exact date of origin cannot be established. It is believed to be a descendant of the old Portuguese Water Dogs and Spaniel root stock that came to Ireland from the Iberian Peninsula. The lineage can be traced back to the period, centuries ago, when the large and important Spaniel group was divided into the Land Spaniels and the Water Spaniels. The Water Spaniels included both the Irish and English varieties of water dogs. 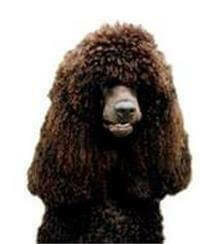 The Irish Water Spaniel was developed in Ireland from two different strains – the Southern County Water Spaniel and the Northern County Water Spaniel. Both were distinct types in size and colour, however today's Irish Water Spaniel more closely follows the Southern type.